Phillips’s multi-disciplinary research grew out of her study of Enlightenment writers who address theories of attention and distraction and who explore what neuroscientists call “cognitive control,” the ability to control and order attention in responsive, context-dependent ways in order to meet specific goals or draw logical conclusions. In Distraction: Problems of Attention in Eighteenth-Century Literature (2016), Phillips analyzes the eighteenth-century cultural preoccupation with distraction and attentiveness and challenges our assumption that distraction is a uniquely twenty-first-century problem. She also suggests that the eighteenth century’s “competing theories of attention . . . transformed the shape of eighteenth-century literature” and require a modified and more complex understanding of the genesis of the novel genre (9). Phillips employs a cognitive cultural approach to literary texts, an interpretive method that applies findings from the fields of cognitive psychology and neuroscience to explain how readers interpret literary texts and to understand how literature can provide valuable insight into human cognition, emotion, and social behavior. My own research examining literature in light of recent findings in cognitive psychology and neuroscience arose out of my persistent sense that eighteenth-century writers seem stubbornly preoccupied with describing and representing the human brain in the process of interpreting, understanding, and evaluating its own thoughts and the thoughts of others. Eighteenth-century writers’ attention to literary texts’ emotional and moral effects on readers; awareness of the “embodied brain”; exploration of psychological interiority; and preoccupation with what cognitive psychologists call “Theory of Mind,” or the ability to “explain observable behavior in terms of underlying thoughts, feelings, desires, and intentions” (Zunshine 195) all attest to the relevance of cognitive cultural studies in analyzing eighteenth-century literary texts. Indeed, I would argue that eighteenth-century literature cannot be fully understood or appreciated without a consideration of shifting Enlightenment concepts of cognition, consciousness, self-fashioning, and social awareness. (1.) The period’s awareness of and deliberate focus on the written word’s cognitive, emotional, and moral effects on the reader. (2.) The period’s growing awareness of the reality of the “embodied brain,” or the close association between mental and physical states. In their text Brain, Mind and Medicine: Essays in Eighteenth-Century Neuroscience (2007), Harry Whitaker, C. U. M. Smith, and Stanley Finger delineate the gradual shift from the simple “clockwork,” “animal spirits,” and “hollow conduit” models of brain and nerve function to more sophisticated models, first posited by Thomas Willis in 1672, which locate “spirit” in “matter” (17 – 18). One of the most striking features of the late-eighteenth-century preoccupation with sensibility is its underlying assumption that the physical body directly, immediately, and intimately reflects states of mind, including emotions, thoughts, and levels of consciousness, an assumption shared by cognitive cultural critics who accept the concept of the embodied brain. (3.) The period’s cultural and literary shift toward the exploration and representation of psychological interiority. In Before Novels: The Cultural Contexts of Eighteenth-Century English Fiction (1990), J. Paul Hunter asserts, “The crucial difference between individuals in romances and novels involves the degree and quality of self-consciousness in novels, a strikingly different awareness of the processes of thought and feeling that affect individuals in relation to their world and their experiences in it” (24). This highly-refined sense of subjectivity and self-conscious awareness, frequently noted by readers and critics of eighteenth-century novels, depends upon and reflects an increasing interest in psychological interiority, or an awareness both of one’s own private, embodied, cognitive space and one’s reflection in the minds of others. The concept of Theory of Mind seems particularly relevant to analyses of eighteenth-century novels. Indeed, most cognitive literary critics accept that the period represents what Blakey Vermeule calls “the beginnings of . . . the high mind-reading tradition in the English novel” (129). 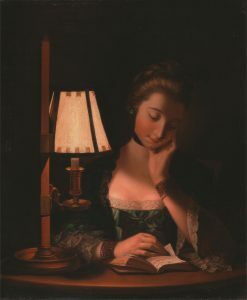 Eighteenth-century readers accepted fictional characters as realistic representations of human thought and behavior, revealing their willingness to draw conclusions about the psychological interiority of fictional characters and practice and refine their own Theory of Mind, a set of interpretive skills equally useful in both real and literary contexts. If recent publication history provides any insight into future trends, the marriage between cognitive cultural studies and eighteenth-century literary scholarship will not only persist but will thrive and prompt further innovative literary exploration. For instance, Karin Kukkonen’s A Prehistory of Cognitive Poetics (2017) uncovers and examines a neoclassical equivalent of cognitive poetics and demonstrates how eighteenth-century writers constructed a “principled, multi-faceted account of how literature entangles and delights the mind” (xi). And Wendy Jones’s Jane on the Brain: Exploring the Science of Social Intelligence with Jane Austen (2017), written for a popular audience, offers an engaging and accessible exploration of Austen’s novels through the lenses of cognitive, social, and evolutionary psychology. Ultimately, scholars of eighteenth-century literature are drawn to the discipline of cognitive cultural studies not simply because it offers innovative approaches literary analysis but because the period’s writers themselves are preoccupied with and fascinated by the way the human mind interprets and makes sense of the world. Eighteenth-century authors depict in explicit and complex ways the cognitive processes by which we strive to understand others and ourselves. Corrie Goldman, “This is Your Brain on Jane Austen, and Researchers are Taking Notes,” The Humanities at Stanford, September 7, 2012. Natalie M. Phillips, Distraction: Problems of Attention in Eighteenth-Century Literature. Baltimore: John Hopkins University Press, 2016. Lisa Zunshine, “Theories of Mind and Experimental Representations of Fictional Consciousness.” Introduction to Cognitive Cultural Studies. Ed. Lisa Zunshine. Baltimore: Johns Hopkins University Press, 2010: 193 – 213. Lisa Zunshine, “Theory of Mind and Fictions of Embodied Transparency.” Theory of Mind and Literature. Ed. Paula Leverage, Howard Mancing, Richard Schweickert, and Jennifer Marston William. West Lafayette, IN: Purdue University Press, 2011: 63 – 92. Joseph Addison, The Spectator. No. 411 and No. 412. “The Pleasures of the Imagination.” The Commerce of Everyday Life: Selections from the Tatler and The Spectator. Ed. Erin Mackie. Boston: Bedford/St. Martin’s Press, 1998: 387 – 393. Harry Whitaker, C. U. M. Smith, and Stanley Finger, eds. Brain, Mind and Medicine: Essays in Eighteenth-Century Neuroscience. New York: Springer Press, 2007. J. Paul Hunter, Before Novels: The Cultural Contexts of Eighteenth-Century English Fiction. New York: W. W. Norton, 1990. Blakey Vermeule, Why Do We Care About Literary Characters? Baltimore: Johns Hopkins University Press, 2011. Karen Kukkonen, A Prehistory of Cognitive Poetics: Neoclassicism and the Novel. Oxford: Oxford University Press, 2017. Wendy Jones, Jane on the Brain: Exploring the Science of Social Intelligence with Jane Austen. New York: Pegasus, 2017. This entry was posted in Announcements, Cognitive Science and 18th-Century Studies and tagged cognitive science, Literature and Science, Theory of Mind. Bookmark the permalink. Dr. Amanda Hiner, Associate Professor of English at Winthrop University, Rock Hill, SC, teaches both graduate and undergraduate courses in literature, critical thinking, and writing, and serves as the Coordinator of Winthrop’s Critical Reading, Thinking, and Writing program. In her primary field of academic research, she has presented papers and published articles on seventeenth-century women’s educational theorists; women and print culture in eighteenth-century England; distributive satire in the works of Henry Fielding and Eliza Haywood; and political satire in the works of Jonathan Swift and Delarivier Manley. She served as co-editor of the 2014 special topics issue of Journal for Early Modern Cultural Studies titled “New Approaches to Eliza Haywood: The Political Biography and Beyond."